The Clare Crusaders Children's Clinic provides free therapy and specialist treatment to over 450 children with special needs in County Clare. 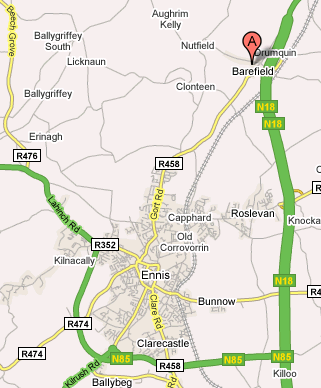 We are a self financing service located in Barefield, Ennis. The Clinic receives no state funding and must raise over €250,000 per annum to provide the current level of therapy for children. The Clinic was opened in 2007 thanks to the dedication and hard work of a group of parents to overcome the lack of publicly available treatment for children with autism and cerebral palsy. It was a community response to the lack of access to services that children with disabilities need in order to meet their potential. We started with one therapist and now we employ 9 staff members delivering approximately 200 hours of therapy per week, catering for over 40% of children in County Clare with special needs. The Clinic is managed on a voluntary basis and we do not charge for access to the therapists to ensure that anyone can access our supports. To assist us with continuing our invaluable services, donations can be made through our website or by making a cheque payable to the Clare Crusaders and sending it to: Clare Crusaders Clinic, Barefield, Ennis, County Clare. Any support you are able to provide is truly appreciated. If you would like more information about the clinic, please email theclarecrusaders [at] gmail [dot] com. You can read more about who we are and what we do. For further information please contact us on 065 6896015 or our Clinic Manager, Ann Norton on 087-6679340. You can also follow us on facebook by following the link on the homepage. Clare Crusaders is a registered charity #16966.